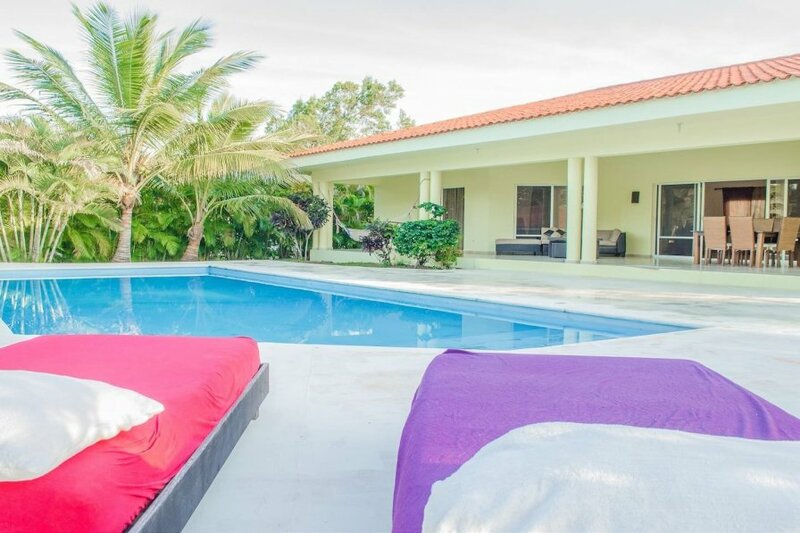 This 5 bedroom villa with swimming pool is located in Sosua and sleeps 10 people. It has WiFi, parking nearby and air conditioning. Whether you’re looking to get away with other couples or a group of best friends, staying together in a vacation rental home in Sosua, Puerto Plata is a wonderful idea. Staying together allows for the amenities large groups need including a full size and fully furnished kitchen and common living areas. Our modern vacation villa has all of this and more; included in the price. Five full furnished bedrooms have space to accommodate everyone with two king beds, four queen sized beds and two single beds. The whole house is hooked up for wireless internet and a main room TV features cable and satellite channels. The home’s bathrooms are also luxurious with imported tile and marble. Step outside the house and into the beautiful backyard featuring natural gardens and a large swimming pool. Have all of your closest friends and relatives hang around the pool enjoying the ocean breeze and wonderful views. Head into town to explore the nightlife scene, bars, top rated restaurants for both lunch and dinner and the casinos. Try your luck on the slots or play some blackjack. Make memories by booking a horseback riding trip for your group and enjoy getting to know the Dominican Republic better while connecting with stunning animals. Create a friendly challenge between friends at the tennis courts and then head to the ocean for even more fun. You’re just steps away from fun no matter which direction you head in from your modern vacation villa in Sosua, Puerto Plata. Book your stay with us today to ensure you can secure your ideal travel plans. Spaces don’t stay open for long and booking right away is always recommended.